BERETTA 627 EELL... SXS STUNNING GUN. Very rare . Great Condition. Single trigger .Barrel selector. RFD transfer. Left hand cast stock with beautifully figured timber, traditional style splinter forend, single selective trigger, 3" magnum and super steel proofed, ABS case. Gun is less than 12 months old and has only fired 250 shells. Pre owned 486 Parallelo in excellent condition having hardly been used. With semi pistol grip stock and beavertail forend, 3" steel proofed chambers and multi chokes. Beautiful new Beretta 486 Parallelo, the modern side by side. Scroll scene rounded action with high grade European walnut this is an elegant and beautifully balanced gun. Beautifully figured high grade woodwork. 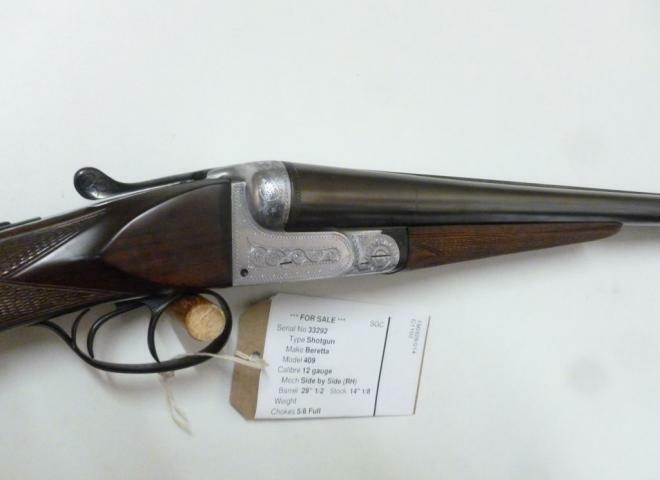 We are proud to be able to offer for sale this stunning 12 Bore Beretta 486 Marc Newson limited edition side by side fixed choke game gun. This Parellelo has only been used a few times, and remains in as new condition. A very rare beautiful Beretta 451 EELL. Beautifully configured dark grain woodwork. The stock measures 34mm @ comb and 45mm @ heel, with LOP being 14 1/2". A very tidy Beretta in excellent condition . This gun is like new, only fired about 50 cartridges. GET THE RELIABILITY OF A BERETTA, BUT THE TRADITIONAL LOOK WITH THIS BERETTA 486 EL WITH A COLOUR CASE HARDENED ACTION. SIDEPLATES WITH TIGHT ENGLISH SCROLL REALLY COMPLETE THIS GUN AS THE IDEAL MODERN SIDE BY SIDE. THE NEW 28GA BERETTA SINGLE TRIGGER , VERY RELIABLE SINGLE TRIGGER SYSTEM . Very good condition. The ultimate all round side by side. Comes with Beavertail forend, semi pistol grip stock, 30 " barrels. Has been registered with GMK for 10 year warranty. Comes with the Beretta motor case, paperwork. THE GUN IS IN GOOD CONDITION WITH A FEW LIGHT MARKS ON THE STOCK BUT THE GUN IS TIGHT AND THE BORES ARE CLEAN. IT HASN'T DONE A LOT OF SHOOTING. A BRILLIANT BERETTA SIDE BY SIDE TO TAKE OUT THIS GAME SEASON. Beretta 486 Parallelo with straight hand stock and single trigger plus 28" fixed choke barrels for delightful handling qualities. THE FABULOUS 486 BERETTA SIDE BY SIDE , RELIABLE SINGLE TRIGGER SYSTEM . Virtually as new condition due to little use since purchased from ourselves. 20G Beretta 486 Parallelo multi choke SBS with straight stock.